Transform your relationship to physical suffering with proven mindfulness practices. If you're reading this, chances are that your life, or the life of someone you know, is shaped by pain—and by the physical and emotional suffering that usually accompany it. 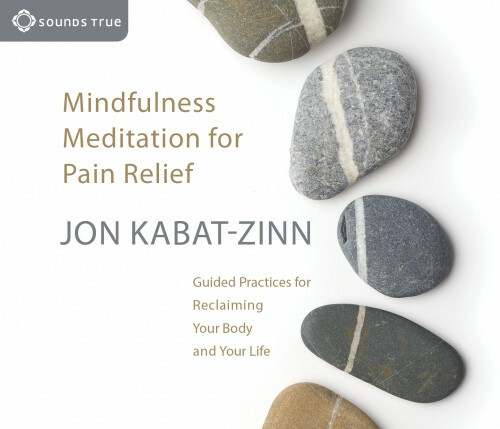 The good news: Jon Kabat-Zinn and his colleagues have helped thousands of people learn to use the power of mindfulness to transform their relationship to pain and suffering, and to discover new degrees of freedom for living with greater ease and quality of life. Now, with Mindfulness Meditation for Pain Relief, the man who brought mindfulness into mainstream medicine presents these approaches for working gently and effectively with even the most trying of circumstances. “Through the systematic cultivation of mindfulness, we can reclaim the entire spectrum of our experience and the joys inherent in living,” explains Jon Kabat-Zinn. Mindfulness Meditation for Pain Relief offers us a precious and tested vehicle for embracing the “full catastrophe” of the human condition and thriving in the face of it. I bought "Mindfulness Meditation for Pain Relief" as a present for a student of mine with sickle cell anemia. His symptoms include severe pain. When I asked him how he liked the CD, his whole face brightened up and he said, "It was so cool! I loved listening to the guy's voice. He actually helped me make some of the pain go away." He is listening to Mr. Kabat-Zinn's CD almost every day now. And I'm certain it's having a positive effect. I have have experienced progressively severe pain for 45 years. Traditional medical approaches - medication & physical therapy - have helped the body in a limited fashion, but not the soul.